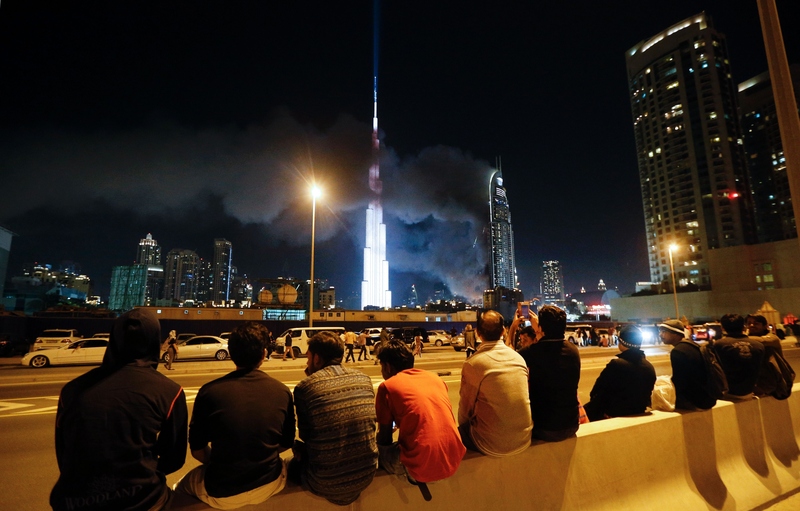 Despite a devastating fire at a downtown hotel that left at least 14 people injured, New Year's Eve fireworks in Dubai went on as planned. According to ABC News, tens of thousands of people were on hand to celebrate and bring in 2016, as social media users urged Dubai to stay strong. It was a jarring juxtaposition though — for many watching both in person and on television, the sight of a flaming 63-story building next to celebratory fireworks was a unsettling sight. Although several injuries were confirmed, officials have not yet released the cause of the fire, though it is not speculated that terrorism is involved. The Address Hotel is part luxury hotel, part residences, and it was completely full for the night. It was sure to be a scary scene for all those involved, as people rushed to evacuate the building. The fire, which according to the Dubai Media Office began on the 20th floor, started outside, and internal fire extinguishers were turned on to prevent the fire from spreading inside. It was a shaky start to the new year for many in Dubai, but those around the city pressed on to bring in 2016 with optimism, instead of fear.